DEMOCRACY DENIED by Phil Kerpen is a book that every freedom loving American should read and have on their bookshelf. It is more than a must read. It is a must have. DEMOCRACY DENIED is packed with must know facts. If you are concerned about what is happening in this nation you must read this book. If you feel that your freedoms are slowly being eaten away by unelected bureaucrats you must read this book. If your business is buried in never ending red tape, a result of over regulation you must read this book. If you are concerned about why this nation is in dire fiscal trouble and debt you must read this book. If you are concerned about why there are no jobs, if you are concerned about where all the jobs have gone, you must read this book. If you are concerned about how the attacks by the Obama Administration has taken your rights Phil Kerpen lays it out in easy to understand terms. We must stand up in opposition and reverse the trend of greater regulatory power. Phil Kerpen details the loss of our Freedom and the endless assault on the Constitution by the Obama Administration. Phil Kerpen has outlined how Obama and his Administration have undermined the founding principles of this Republic. This book documents every infringement and has solutions and a road map to recovery, and once again, you must read "DEMOCRACY DENIED". And after you read it, keep it. Encourage your family friends and neighbors to buy this book. Phil Kerpen's book is the best accumulation of facts of why President Obama and his Administration do not deserve a second term. If you love America, and the Constitution please read this excellent piece of research. 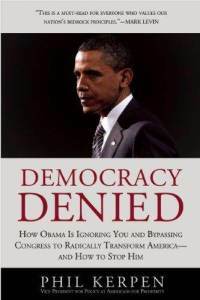 "DEMOCRACY DENIED", In his own words, Phil Kerpen will inform you with facts, "How Obama is ignoring you and bypassing Congress to radically transform America- and how to stop him." Phil Kerpen says, "The message from Obama and his administration was clear: we will accomplish our policy objectives at any cost and by any means. Indeed that's how they would push two major pieces of legislation they wanted, ObamaCare and Dodd-Frank in the health and financial realms, respectively." DEMOCRACY DENIED is not only a well written expose of how Obama has turned this nation nearly inside out, but offers strong solutions, and has forty pages of notes and a lengthy index. Mr. Kerpen has done his homework and has performed a great favor to each and everyone of us. He is one of my heroes for this bold clearly stated book and I am honored to have been requested to review his book.